Going vegetarian or vegan can be quite a commitment, so how do you decide and more importantly, how do you maintain your momentum during the shaky transition period? 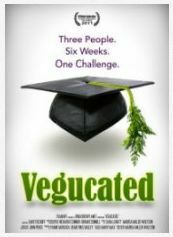 Vegucated explores the world of beginner veganism from the perspective of 3 different individuals from New York, all with different reasons. While the producer herself is along for the journey and provides much of the up front educational and overview commentary, she is absent for much of the meat (pardon the pun) of the movie. The production quality and quirkiness of the producer is quite apparent from the beginning, however, the authenticity of the journey into the vegan lifestyle is preserved. Handheld video cameras and ‘confession style’ excerpts are found throughout, so you really get the feeling of what the newly vegans are going through. A poignant visit to an old and abandoned slaughter house and toned-down exploration into factory farms and processing was well approached and does not leave you feeling you were just violated by a disturbing PETA video. In other words, you get the point without having to see too much. All in all, it is a raw and quirky look into the struggles and benefits of going Vegan from a beginners perspective. Certainly not an in-depth look by any means, but a good starter for those interested in what it may be like.